But pancakes and politics are only part of the appeal of UO’s newest residence hall. 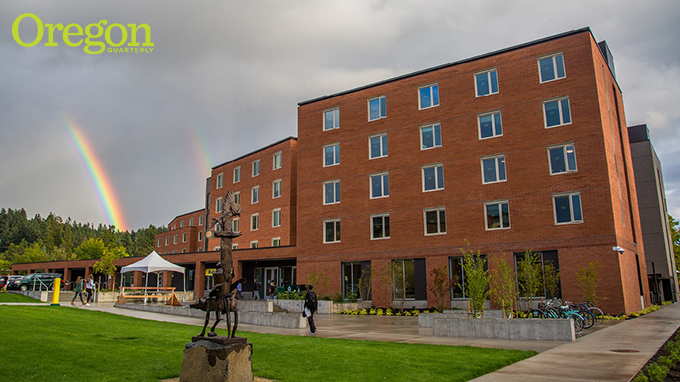 Kalapuya Ilihi, which opened last fall to approximately 500 students, houses four new academic communities and honors one of Oregon’s indigenous peoples. The homage to Oregon’s indigenous peoples continues in and around the building with original artwork by James Lavadour, a member of the Walla Walla tribe whose paintings reflect his people’s connection to their northeast Oregon homeland, and a bronze casting of a sculpture by the late Rick Bartow, a Wiyot tribal member from Newport. Just west of the new hall is the Many Nations Longhouse, a community space for Native American students. Designed by Native American architect and UO alumnus Johnpaul Jones, ('67, BArch, architecture), the center must have an unfettered view of sunrise for ceremonial purposes. To accommodate that, Portland-based Mahlum Architects conducted extensive solar studies to ensure that neither Kalapuya Ilihi Hall nor Global Scholars Hall casts a shadow on the longhouse at any time. “That whole little area is like a Native American quad now, because we’ve got the longhouse, we’ve got Kalapuya Ilihi Hall. The Northwest Indian Language Institute is right there. We’ve got the Rick Bartow sculpture in the middle, so it all comes together in a really nice way,” Klopotek says. The building’s architecture further promotes a sense of community, with multiple learning and collaborative spaces that enable students and faculty members to get together. 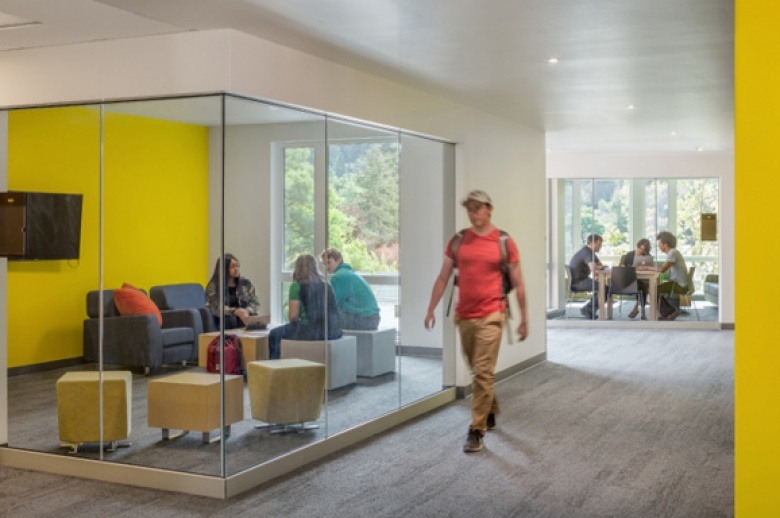 Highlights include a bright and airy maker- and hacker-space for students to work on projects or satisfy artistic impulses, glass-enclosed study rooms, and plenty of lounge spaces. 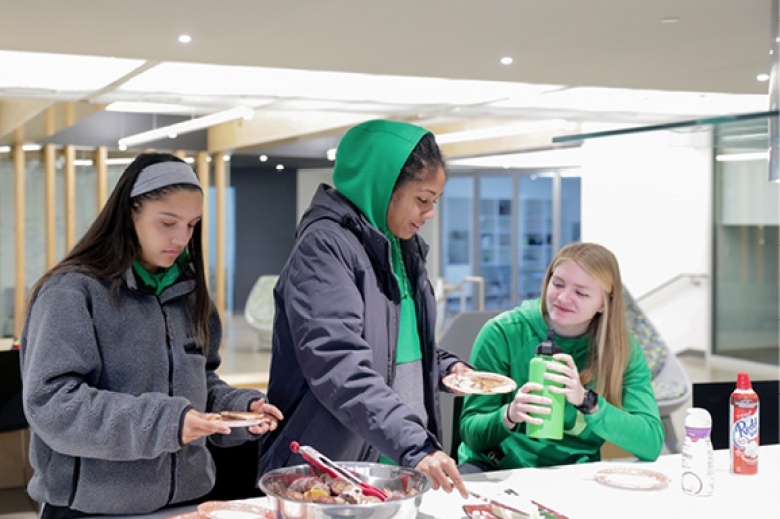 The residence hall is also home to new academic residential communities (ARCs) that offer students with shared academic interests or majors an opportunity to live and study together with teachers, advisors, tutors, and peer mentors. The communities, all based on social justice, cover Native American and indigenous studies, art and design, social activism, and media and social action. Having a faculty member in residence is also a big plus for first-year students. Thompson is more than happy to engage hallmates in conversations about her research areas, which include race and ethnic politics, inequality, and American political development—but that’s not the only reason Kalapuya Ilihi residents appreciate her. Nicole Levi, class of 2021, just likes to have a professor close at hand. “If I need study help or I feel like I’m not really studying effectively, or if I have a question about what she teaches, then she’s right here, which is so nice,” Levi says. Describing her residence position as “a happy side job,” Thompson sees her role as an informal advisor. She stresses the importance of living on campus for all first-year students, regardless of whether they join an ARC.